Innovation and entrepreneurship play an ever-increasing role in growing Africa's emerging technology ecosystem. According to research by the GSMA Ecosystem Accelerator, over the past two years alone, Africa has seen the number of innovation hubs double. 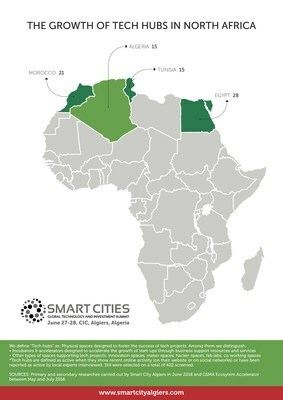 Whilst the big 3 cities - Nairobi, Lagos, Cape Town - have been dominating the Sub-Saharan growth narrative, the next wave of incubators are arriving from new ecosystem cities in North Africa. And the cities driving this growth, Casablanca, Cairo, Sousse and Algiers, are serious about generating sustainable operating models in the fast evolving ICT landscape to overcome core business challenges around viability, future-proofing the business and most importantly, producing continuous success stories. According to the Disrupt Africa Tech Start-ups Funding Report 2017, funding in African tech start-ups surged 51% to reach $195 million in 2017, as compared to figures of the same period in 2016. When it comes to funding, the majority of Africa's tech hubs are grant funded by Governments and foundations, however there has been a growth of social ventures and a trend toward for profit and self-funded endeavours to fast track growth. Rabeh Arezki, Chief Economist for Middle East and North Africa Region (MNA) at the World Bank stated, "When it comes to sustainable funding, African tech hubs tend to focus on demand-driven service models that solve problems and support the specific needs of an ecosystem. To succeed, a modern innovation hub needs to pinpoint a niche in growth areas and deliver that proposition. Key areas ripe for development are start-ups looking at improving Internet infrastructure, payment systems and education. These are the types of businesses we see succeeding." Algiers has been claiming a highly favourable investment climate and hosting major regional events like the upcoming Global Smart Cities Technology and Investment Summit on June 27-28 2018, where 4,000 smart city leaders from around the world will discuss how smart technology and ecosystems, smart data and sustainability and the Government's role in stimulating new technology are changing the landscape. Founder of Smart City Algiers, Fatiha Slimani said "Algiers smart city project is in a way our commitment to develop our city based on principles of durability, sustainability and innovation. We're trying to find solution to what we call - the cascading technology trap - where technology moves way faster than policy makers' decision making." We are also seeing the new innovation hubs adopting hybrid systems to enable sustainability. Many choose a mix of community tech space and 'paid-for' co-working space, though corporate partnerships are increasingly becoming more common, especially though mobile operators. Over 14% of active tech hubs in Africa now supported by mobile operators like MNT, due to the opportunity to scale quickly. Examples of this include Orange-Start on in Morocco and Djezzy's ENP Incubator Algeria. Others create their own private funds by taking equity in early stage start-ups whilst offering business support. What's significantly changing is that collaboration is pushing the agenda forward. This coming together is fuelled by the increasing awareness that start-ups in Africa will play a key role in the development of the continent's societies and economies. Africa's informal economy combined with multiple local stakeholder and restrictive regulations make expansion across more than one region a significant test. In many cases it takes a local ecosystem that can promote growth and social development to expand a business' impact and by investing in a good ecosystem can be a source of competitive advantage.